BIRMINGHAM, Ala. – Amjad Javed, Ph.D., and University of Alabama at Birmingham colleagues have found a key role in tooth development for the transcription factor Specificity protein 7, or Sp7. Using an animal model, the UAB researchers found that a lack of Sp7 interrupts the maturation of two types of specialized cells that help create teeth. Such basic knowledge about the development of teeth or bones adds to understanding of craniofacial abnormalities, which are among the most common birth defects in humans. Transcription factors are proteins that interact with DNA to turn genes on or off. In embryos, they guide differentiation from the single fertilized egg into all cells that form the different tissues and structures of the body. One of those complex structures is the tooth. The teeth of mammals develop during embryonic growth, though they erupt only after birth. 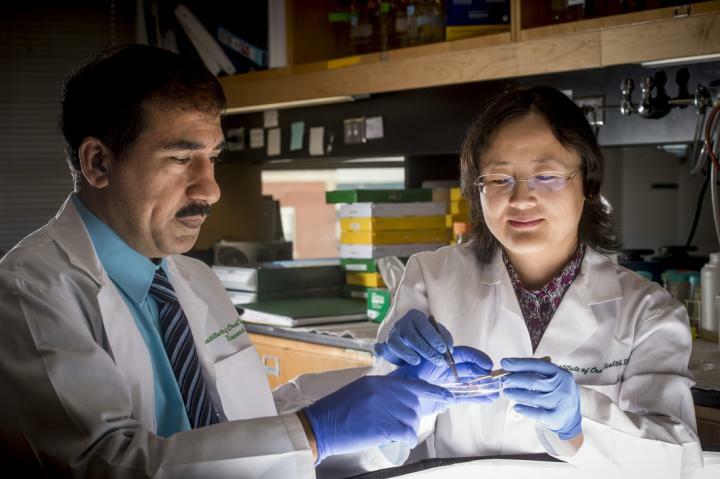 In research published in the Journal of Bone and Mineral Research, Javed, a professor in the UAB School of Dentistry's Department of Oral and Maxillofacial Surgery, used a mouse model with mutations in both copies of the gene for Sp7. It was previously known that Sp7 is required for bone development. Embryos with a double mutation in Sp7 completely lack mineralized bone. In humans, mutation of the Sp7 gene causes osteogenesis imperfecta, a condition that affects the development of bones and craniofacial structures. However, the role of Sp7 in embryonic tooth development was unknown. Through study of mice lacking Sp7, Javed and colleagues found that initial tooth morphogenesis was normal, even though the animals lacked mineralized tooth sockets. However, tooth development did not continue — the animals failed to produce normal dentin, the hard tissue that forms the bulk of the tooth, and they failed to produce normal enamel, the super-hard matrix layer that covers the tooth. This was due to reduced proliferation, maturation and polarization of the tooth-forming cells called odontoblasts and ameloblasts. Odontoblasts line up side by side inside the developing tooth to form a sheet of columnar cells that deposit dentin. Similarly, ameloblasts line up side by side in a sheet outside the developing tooth to lay down enamel. Without Sp7, the animals had small, misshapen teeth, and the odontoblasts and ameloblasts failed to mature beyond the pre-odontoblast and pre-ameloblast stage, as measured by absence of mature cell markers for those two types of cells. The odontoblasts and ameloblasts were fewer in number and showed disorganized alignments. The researchers found that Sp7 in normal mice was expressed only in the dental mesenchymal tissue that gives rise to odontoblasts; it was not expressed in the oral epithelium that gives rise to ameloblasts. Since it is known that 13 different members of the fibroblast growth factor, or Fgf, family act as signaling proteins between the two different tissues — dental mesenchyme and oral epithelium — during murine tooth development, Javed and colleagues looked for changes in Fgf ligands in the mice lacking Sp7. They found that the Fgf3 and Fgf8 ligands, which are abundant in normal tooth development, were remarkably absent in incisor and molar teeth of the animals lacking Sp7. This indicated that a disrupted cross-signaling between mesenchyme and epithelium was the reason for the failed maturation of ameloblasts. Furthermore, they found that the Sp7 transcription factor directly controlled gene expression of the Fgf ligands. Altogether, the UAB researchers concluded that Sp7 is obligatory for differentiation of ameloblasts and odontoblasts, but not for the initial tooth morphogenesis. Co-authors with Javed on the paper, "Specificity protein 7 is required for proliferation and differentiation of ameloblasts and odontoblasts," are co-first authors Ji-Myung Bae and John C. Clarke, and Harunur Rashid, Mitra D. Adhami, Kayla McCullough, Jordan S. Scott and Haiyan Chen, Department of Oral and Maxillofacial Surgery, UAB School of Dentistry; and Krishna M. Sinha and Benoit de Crombrugghe, M.D. Anderson Cancer Center, the University of Texas. Support came from National Institutes of Health grant AR062091.